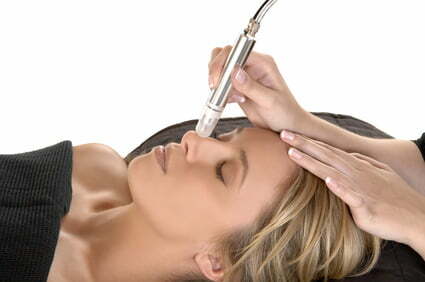 Microdermabrasion is one of the more recent skin-care techniques. It is equivalent to an instant skin plumping and purifying treatment without the chemicals. It has been called the modern, virtually painless alternative to a chemical peel. Microdermabrasion is a rejuvenation and anti-aging treatment, which consists of passing a hand held wand with a sterile diamond head over the skin. This provides a deep exfoliation of the upper layer of the epidermis. Microdermabrasion has shown great results in improving the appearance of fine lines and patches of pigmentation, as well as acne in younger clients. Results should be immediate dependant on skin type, but when carried out regularly, encourages cell renewal resulting in a healthy plumped and glowing skin. Rejuvenation of sun damaged skin – face, neck, shoulders, back, arms and legs. Minimization of blotchy skin colouring. Reduction of acne and superficial scars. Improvement of overall skin health. Visible results after the first treatment, we recommended a course of 6 to 12 treatments to achieve the maximum results. Treatments can be done every week during the first course of treatments and one monthly treatment thereafter for maintenance. Consultation, cleanse, followed by Diamond Micro-dermabrasion and moisturise. Consultation, cleanse, followed by Diamond Micro-dermabrasion, collagen mask with visible skin smoothing, protective and anti-ageing properties, tailored skin ampoule and moisturise.